What are the benefits of Yoga for the skin? There is an increasing amount of scientific and medical research demonstrating the many short term and long term benefits of practising yoga and meditation. Some of these include increasing body awareness, relieving stress, reducing muscle tension, strain and inflammation, sharpening your concentration and calming the nervous system. Yoga and meditation also offer significant mental health benefits and have been shown to enhance social well-being through providing a sense of belonging to others, and improving the symptoms of anxiety and depression, attention deficit and hyperactivity, and sleep disorders. Clinical trials are now beginning to demonstrate that treatment outcomes for skin conditions and other health concerns can be drastically improved when medical treatment is combined with targeted mindfulness programs. It is well known that many skin conditions and other health ailments are exacerbated by stress, therefore, by reducing the mind and body’s stress response or removing the response all together, we can increase health outcomes drastically. When and where are Coco's yoga classes? 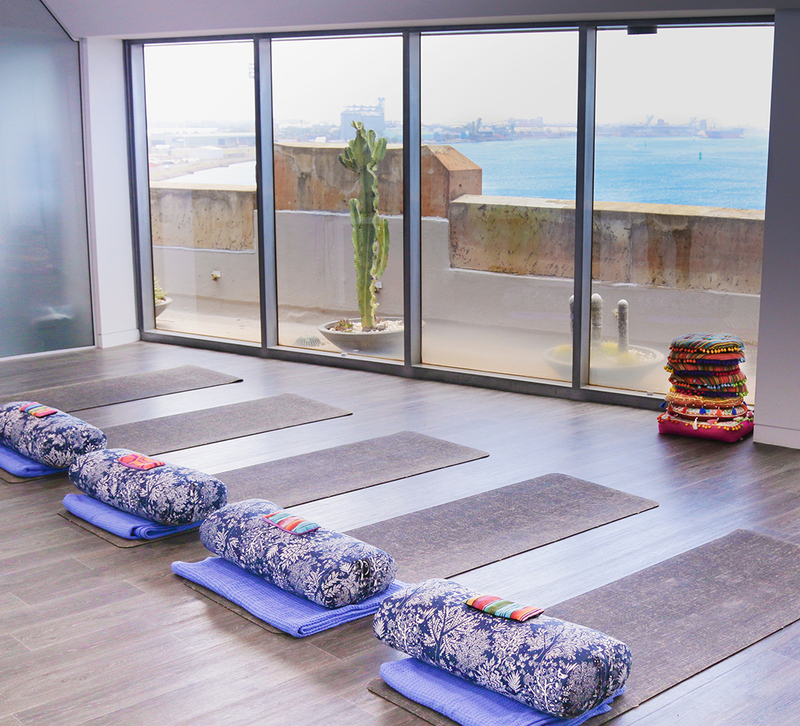 Coco offers classical Hatha Yoga classes from Monday to Friday each week in their dedicated yoga and meditation studio located on the harbour side of the clinic with sweeping views of the harbour. What makes Coco's yoga classes unique? All yoga classes at Coco are suitable for both men and women, all levels and all ages, for the beginner to the advanced yoga practitioner. Each class runs for 1hr 15mins and is limited to only ten yoga mats which allows the yoga instructor to work closely with each student and tailor the instructions to suit each individual according to their particular needs. Coco’s classes incorporate themes and focus on subjects of yogic philosophy that can benefit the student and encourage deeper learning of yoga science. Hatha Yoga is a classical form of yoga that is generally slower in pace than other modern forms of yoga. There is a key focus on the link between the breath (pranayama) and the movement (asana) which encourages the student to draw the mind’s focus inwards to reach deep concentration. By carefully integrating these two components, the practice prepares the body and the mind for deeper meditation and reflection. This lineage of Hatha Yoga was developed by Sri T. Krishnamacharya who is widely considered to be the father of modern yoga for his role in training, educating and directly influencing most modern forms of yoga. All classes cost $20. Classes must be booked in advance either online using the link below or by phoning Coco on 4927 8088. Lisa has been studying and training in various energy based practices for over twenty years, including various forms of martial arts, Reiki, meditation, spiritual healing, yoga and yoga therapy. She has also been co-teaching a 350 hour diploma course in Yoga Teacher Training for the past four years. Lisa currently teaches two yoga classes per week at Coco and offers personal consultations in yoga and yoga therapy. Lisa is passionate about assisting others towards developing a personal yoga practice to use at home, based on the teachings of Sri T. Krishnamacharya and his son TKV Desikachar among others. She has travelled to India on several occasions and participated in many personal spiritual retreats. The wisdom of these traditional practices including asana, pranayama, meditation and gentle chanting stand strong in today’s modern, busy world and lead one on a journey towards personal health, healing and transformation. Joe has been practising yoga for over ten years and is passionate about the role yoga plays in mental health as a stepping stone to calming the mind. He also has a keen interest in the application of yoga in sport. Joe places great importance on modifying his classes for the individual to ensure their enjoyment of the class along with the best possible outcome for each student. Joe’s classes utilise all the available tools of yoga including movement, breathing techniques and sound. Joe is an accomplished musician and he understands the valuable role that sound can play in achieving mindfulness and peace of mind. Along with Joe’s passion for yoga and music he values his role as a husband, father and mentor. Joe also spends one morning each week working with clients with acquired brain injury. Joe has a 350 hour Diploma in Yoga Teaching and teaches regular classes at Coco twice a week. Renee is a dedicated yoga teacher having studied a 350 hour Diploma of Yoga in the lineage of Krishnamacharya, “The Father of Modern Yoga”. She has also delved deeper into the sacred yogic texts – the Bhagavad Gita and the Upanisads. Renee Is passionate about yoga for health and well-being and has studied specifically yoga for anxiety and depression. Renee is mother to three beautiful children and her passion for service, kindness and raising “good humans” inspired her teaching journey, having realised the importance of sharing wisdom with others. She is currently undertaking meditation studies and yoga therapy concentrating on an individual’s holistic well-being. Renee has a background in management and loves being in nature, particularly the ocean. She is on the eternal chase for the most perfect blue to swim in!